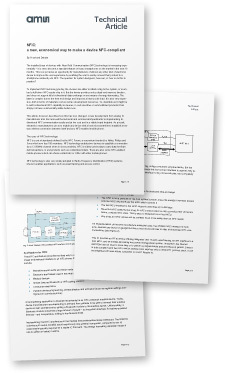 A new white paper is now available to download free of charge from NFC World. “NFiC: A new, economical way to make a device NFC-compliant” has been produced by analog chip specialists AMS and is designed to help device makers understand the full range of options now available for adding NFC functionality to electronic products of all types. Download this white paper and you’ll learn how advances in NFC technology are now making it possible to go beyond simple NFC pairing to include full two-way NFC capabilities in a wide range of electronic devices — more cheaply, quickly and easily than has previously been possible. You can access the white paper here. • “NFiC: A new, economical way to make a device NFC-compliant” is presented by AMS, an NFC World white paper partner. Find out how to become a white paper partner here.